FORT COLLINS, Colo., April 17, 2018 /PRNewswire/ — Wherever adventure awaits in the galaxy, everyone deserves a case with style plus hyper-protection. The new Solo: A Star Wars Story Symmetry Series cases is the most loyal co-pilot one could ask for and protects the latest Apple and Samsung devices. The Solo: A Star Wars Story collection is a tribute to the iconic character and his place in the Star Wars legacy. “Millennium Falcon” features the shiny Millennium Falcon graphic with “not a scratch on her,” “Chewbacca” inspires Wookiee roars and “All or Nothing” displays symbols representative of a galaxy far, far away…. These Solo: A Star Wars Story-themed cases are being added to a line-up of Star Wars Symmetry Series for iPhone 8, iPhone 8 Plus and iPhone X. Other cases feature characters from Star Wars: A New Hope to Star Wars: The Last Jedi, including BB-8, Ray on Ahch-To, a stormtrooper, Darth Vader and a “Resistance Red” Star Wars logo. Solo: A Star Wars Story Symmetry Series collection cases are now available at otterbox.com for iPhone 8 and iPhone 7, $44.95; iPhone 8 Plus and iPhone 7 Plus, $54.95; iPhone X, $54.95; Galaxy S9, $44.95; and Galaxy S9+, $54.95. 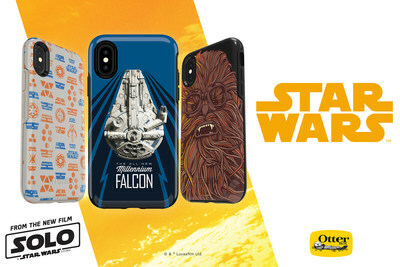 For more information, visit otterbox.com/starwars. OtterBox is the “Official Protective Case” of Walt Disney World Resort and Disneyland Resort. 1 Symmetry Series is NOT protective against water. Will provide added protection against drops and shock. It also hasn’t been tested to protect against blaster bolts, unfortunately that technology isn’t currently available on Earth.